The Territorial Aeronautical Commission considered in December 1929 that if the baseball field at Kalaupapa was cleared of stones and the take-off lengthened about 250 or 300 feet, it would give the Territory a good emergency landing field on the island. The work on the field would be done by patient labor, not to exceed $500. There was almost a constant wind at the upper end of the field. However, it was decided that no steps would be taken to acquire the field until a letter came from the superintendent of the Leper Settlement. In January 1930, the Board of Health agreed to pay half of the cost of developing the field. A Commission investigation showed that it would be impossible to make the field serviceable for the type of aircraft now in operation as it is too short unless a stone wall surrounding the dairy farm was removed and a sand ridge approximately 25 feet, some 20 or 30 feet from the sea shore boundary was leveled. The ridge is an old burial ground and it was not known whether it would be possible to have it moved. The TAC agreed that if the ridge could be leveled it would spend $1,500 to condition the field. The Leper Colony declined moving the sand ridge burial site. However, further investigation showed that a 1,585 foot runway was possible by clearing and filling the area and removing the wall enclosing the dairy site, extending the field at this point to 420-feet in width. Proceeding would be dependent on Inter-Island Airways interest in serving the airport. In January 1931, Inter-Island flew over the field and felt that it was too small for Sikorskys to attempt landing; however, providing improvements were made smaller planes could be landed in the field. In view of Inter-Island’s lack of interest, the TAC decided not to make any improvements to the field. The superintendent of Kalaupapa Leprosarium suggested a new site for an airport near the lighthouse in July 1931. The site was reviewed by the TAC as it could be developed into a two-way field with zero approaches at either end; the field had sufficient length and with clearing and a certain amount of grading would provide sufficient width. Estimates for the work were approved. A layout for the airport was developed with a 1,925-foot runway. The cross-wind runway was eliminated. The tracings were approved on October 15, 1931. Kalaupapa Airport was opened to operations in 1934 and was served by Inter-Island Airways, now Hawaiian Airlines, with Sikorsky S-38, eight-passenger amphibious aircraft. Service was discontinued by Hawaiian because the field was too small and too rough for use by Sikorsky S-43s and Douglas DC-3s. In December 1940, plans and cost estimates for a 3,000-foot flight strip were forwarded to Washington, D.C. and in July 1941, an allotment of $55,000 was granted for its construction. In November 1941, the Governor and the Superintendent of Public Works signed a contract to maintain and operate the airport when complete. On December 7, 1941, when World War II began in Hawaii, the contract had been let and work was ready to start. All work was cancelled. During World War II, Gambo Flying Service was authorized by the military to furnish emergency transportation of medical supplies, etc. direct to Kalaupapa. After the war, Andrew Flying Service and Cockett Airlines began serving Kalaupapa on a daily basis with Beechcraft and Cessna planes. Until December 7, 1941, all requirements of the Leper Settlement were handled by small freighters of the Inter-Island Steam Navigation Co. Ltd. Since the outbreak of the war the only freighter services has been provided by small craft of the sampan type chartered by the Board of Hospitals and Settlement. Service is irregular, unusually expensive and far too casual to serve the Settlement satisfactorily. Interisland Steam Navigation Co. Ltd’s fleet has been considerably curtailed because of the great cost of steamship operation and diminished demand for surface transportation. The company has decided that it cannot resume service to Kalaupapa. The present sampan service is augmented by ai8r service furnished by Andrews Flying Service, a non-scheduled operator, now flying approximately 50 round trips per month from Honolulu. Service is limited to small planes because the make-shift landing strip is only 1,800 feet long. In 1944, the Post War Planning Division of the Territorial Department of Public Works confirmed that the Civil Aeronautics Commission would fulfill its contract and would advance additional funds to complete a flight strip 4,000-feet by 500-feet with an oil macadam runway 4,000 feet by 150 feet. The proposed cost was $135,000 for construction. In 1947 the Territorial Department of Public Works proposed constructing a Class II Airport at Kalaupapa. The proposed airport would serve the Leper Settlement. The population consisted of approximately 330 patients and 65 employees, and allows visitors, principally from Oahu. “It is believed that the facts amply justify the proposed airport,” the Superintendent of Public Works stated. “Plane operating conditions are favorable and with an adequate airport it is reasonable to expect that all requirements of the Settlement, other than ‘heavy lifts’ and such bulk commodities as fuel, will be transported by air. “The provision of landing facilities for large aircraft should result in lower transportation cost and thus encourage more frequent visits by relatives of patients. A scheduled service would add to the efficiency of all operations of the Settlement and to improvement in the condition and attitude of the patients. Such service would also be a great factor in the contentment of the non-leper employees and in keeping them on the job. In July 1941, an allocation of $55,000 was made by the CAA but on account of the intensive National Defense Program in Hawaii, it was not possible to start constriction. No portion of the said allocation has been utilized by the Territory. By Act 153, Session Laws 1945, the Legislature appropriated $50,000 for the airport. The Superintendent of Public Works has indicated that the Territorial administration will recommend to the 1947 Legislature the appropriation of such additional sum as may be found to be necessary. It is planned to start construction shortly after CAA approval. 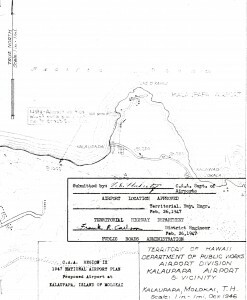 The CAA approved a single 2700 feet by 300 foot long runway for Kalaupapa as part of the CAA Region IX 1947 National Airport Plan as proposed by the Superintendent of Public Works in the Kalaupapa Master Plan dated November 1946. Although Kalaupapa peninsula is under the jurisdiction of the Board of Health, it was agreed that the Hawaii Aeronautical Commission would accept responsibility of airport maintenance and operations. The problems were extensive but were eventually resolved. In 1951, a small passenger terminal with rest house was completed. Up to that time there were no passenger facilities available. The field was sod on sand and as a result was very rough, causing discomfort to passengers and excess wear to aircraft using the area. In spite of the fact that Kalaupapa strip is adjacent to the windward beach of Kalaupapa peninsula and subject to heavy salt spray from wind blown surf, the HAC thought the roughness could be alleviated by a good stand of grass. Accordingly, water storage tanks and a pipe line with hose bibs were installed. Although this proved helpful, it was not sufficient to counteract poor nourishment in the sandy soil and erosion from high winds and propeller blast. Accordingly in 1951, a small paved warm-up apron was constructed. This eliminated the trouble at the warm-up or down-wind end of the landing strip but was of no help for the runway problems. In 1954, a paved runway with sodded shoulders was completed. The field is now in satisfactory condition despite the fact that grassed areas are still rough and difficult to maintain. Although the number of people at Kalaupapa is small and ordinarily would not justify such an airport, it must be borne in mind that air service is now almost the only means of transportation between the peninsula and the outside world. Barge service is irregular, there being only about three barges a year, and all daily needs such as mail, bread, vegetables, newspapers, etc., are supplied by air. In 1955, the airport consisted of 17 acres, and had one paved runway, 5-23, which was 50-feet wide and 1,658-feet long. The airport was served by Andrew Flying Service and Cockett Airlines. Facilities included a passenger terminal building, paved runway, wind socks and field maintenance. A $9.2 million project to upgrade Kalaupapa Airport was completed in September 1992. Plans and specifications were prepared and a contract awarded to the Kalihi Contracting Company for the sum of $16,850. 88 for the construction of an aviation field at Kalaupapa. The work consisted of performing all the excavation and fill, the construction of a frame rest house 18 feet wide and 26 feet long, with an asphalt shingle roof, and approximately 3,100 feet of wire fencing. The field comprises an area of approximately 16 acres and is 1,950 feet long. The work was completed. Kalaupapa Airport opened and served by Inter-Island Airways. Kalaupapa Leper Settlement was isolated and the Gambo Flying Service was authorized by the military to furnish emergency transportation of medical supplies, etc. direct to Kalaupapa during World War II. These flights were made by Marguerite Gambo with a Fairchild monoplane which was suitable for operation into the small field at Kalaupapa. Act 153, Session Laws of Hawaii 1945, appropriated $50,000 for location and aerological studies for the airport. Act 23, SLH 1947, appropriated $40,000 for paving and improvements. 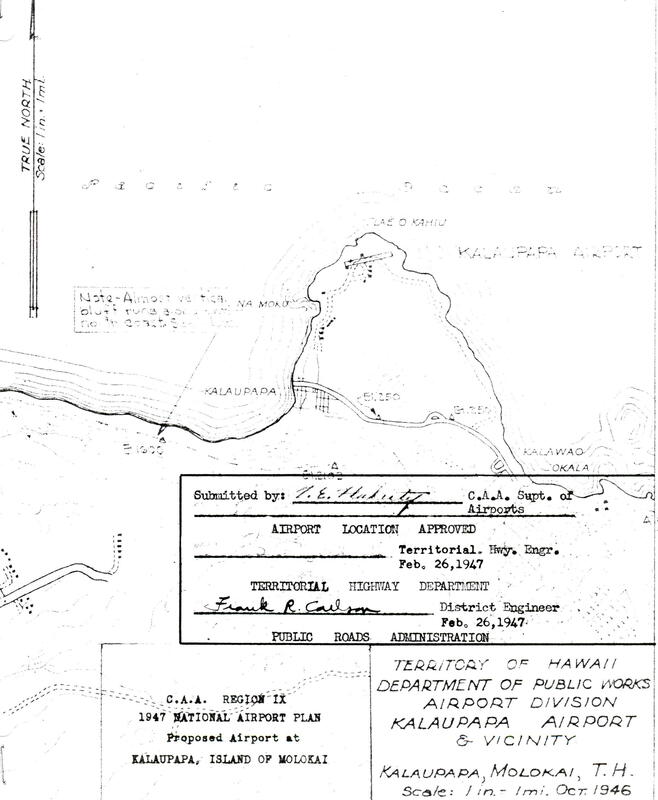 Act 32 of the 1947 Legislature, placed Kalaupapa Airport under the management of the Hawaii Aeronautics Commission. Plans for some rather extensive improvement are being considered and work will be accomplished using a crew of residents of the Settlement. The HAC approved the following improvements at Kalaupapa Airfield: installation of a 2,500 gallon water tank and pipe line; filling of the gaps and roll the present runway; and see what can be done to extend the runway. This field, a turf strip 400 feet wide and 1,800 feet long, at the Kalaupapa Settlement, is operated and maintained by the Hawaii Aeronautics Commission in cooperation with the administration of the Settlement. One of the few star air mail routes operated under contract by the U.S. Post Office Department was inaugurated this period by Cockett Airlines. This marked a great step forward for the Kalaupapa Settlement on the Island of Molokai as the only mail service formerly supplied was by small surface craft operating on a weekly basis. In addition to the air mail service other operators have daily flights for delivery of newspapers, fresh milk, produce, etc. The HAC entered into a contract with the T. H. Board of Health to have a regular caretaker employed to care for the field after it is completely finished. Act 23, SLH 1947, authorized $39,835.57 for improvements and paving at Kalaupapa Airport. As a result the Commission authorized building a passenger shed at Kalaupapa from materials available at Puunene, in an amount not to exceed $10,000. A program of enlarging and improving this airport has been undertaken. Labor from the Settlement has been utilized on the work of lengthening the runway 300 feet, installing water line for irrigation and paving a warm-up pad. An appropriation of $1,000 was approved to extend the take off apron to 240 feet at Kalaupapa. A dedication ceremony was held at Kalaupapa for the new terminal/rest house building. Construction cost was $4,772. The HAC appropriated $16,250 to lengthen the runway at Kalaupapa from 250-feet to 750-feet and to widen it from 50-feet to 60-feet to permit planes to land on paved areas. Sum of $30,000 approved for lengthening of Kalaupapa airstrip. The runway at Kalaupapa was extended to bring it to 1,000 feet. The Kalaupapa runway pavement project was completed. A sod on sand runway was replaced by a paved runway. Cost: $65,162. The HAC appropriated $850 for the construction of a new equipment building at Kalaupapa Airport. The last storm destroyed the old equipment building. The HAC appropriated $4,500 to make necessary repairs and alterations to the Kalaupapa Terminal Building and $1,350 was appropriated for a new equipment building. The HAC approved an appropriation of $700 for resurfacing Section 1 of the Kalaupapa runway. Act 195, SLH 1961, appropriated $10,000 to repave the access road and auto parking area. Act 217, SLH 1967, appropriated $10,000 for the installation of a 3inch waterline from the existing settlement line to the airport terminal building. Act 40, SLH 1968, appropriated $24,000 to extend and improve the existing runway. Act 155, SLH 1969, appropriated $190,000 for the extension of the existing runway and other improvements. The contractor was given notice to proceed with the extension of Runway 5-23. The work will extend the runway from 1,958 feet to pavement of 2,750 feet. Cost: $186,100. The extension of Runway 5-23 was completed. The work extended the paved area from 1,658 feet to 2,760. Now that the runway is completely paved, a hazard has been eliminated for all traffic using this strip. Cost: $186,100. The airport is one mile north of the colony of Kalaupapa. It had a paved runway and a small terminal. The airport had no beacon but there was a strong surface navigational lighthouse within one-half mile east of the runway. There was a single attendant and one small fire vehicle. Governor’s Executive Order No. 2732 set aside 42.225 acres of land for an addition to Kalaupapa Airport. Act 10, Special Session 1977, appropriated $104,000 to realign the roadway and install fencing. The Essential Air Service (EAS) program of the U.S. Department of Transportation was established in response to fears that as the U.S. airline industry was deregulated, air service at small communities would decline as local-service carriers shifted their operations to much larger city pairs. Under the EAS program, any airport receiving service by a U.S. DOT certified carrier in 1978, or 10 years prior, was designated an essential air service airport. Kalaupapa was designated as an eligible point to receive Essential Air Service under the Airline Deregulation Act of 1978. Civil Aeronautics Board Order 79-10-3, the Bureau of Domestic Aviation, defined essential air service for Kalaupapa as follows: A minimum of two daily round trip flights to Honolulu per day. Act 214, SLH 1979, appropriated $40,000 to construct a new maintenance building and expand the passenger terminal building. Civil Aeronautics Board Order 79-10-3, the Bureau of Domestic Aviation, defined essential air service for Kalaupapa as follows: A minimum of two daily round trip flights to Honolulu providing a total of at least 62 seats in each direction per day, six days a week. Design began on terminal maintenance facilities. Act 316, SLH 1989, appropriated $5.75 million for design and construction improvements to the runway, taxiway, access road, apron, utilities, etc. The Kalaupapa Airport Master Plan Program was completed and published. Early in 1988, a Governor’s task force was formed to plan and coordinate efforts to improve transportation facilities at Kalaupapa. The committee was necessary to im0-r9ve roads, the harbor and airport at Kalaupapa. Edward K. Noda and Associates was hired to develop the master plan in October 1988. The airport is owned by the State of Hawaii under a cooperative agreement with the National Park Service of the U.S. Department of Interior. The airport serves the settlement which has a population of approximately 150, as well as limited number of visitors to the park and settlement. At this time, Kalaupapa was served by one regularly scheduled commuter airline, Aloha Island Air, which operated deHavilland DHC-6 aircraft. The airfield had one runway (5-23) what was 2,760 feet long, 50 feet wide and paved with asphaltic concrete. There was no paved taxiway or apron on the airfield. Aside from wind cones each end of the runway, there were no landing or navigation aids. The passenger terminal was a small, wooden frame building that mainly served departing passengers. There were no baggage handling facilities for passengers. There were two wooden frame structures near the terminal building that provided administrative, maintenance, fire fighting and storage space for airport operations. A total of 100 visitors were permitted per day at Kalaupapa. The quota was established by the residents of the Settlement and enforced by the State of Hawaii Department of Health. Widen, lengthen and rotate the runway (nominally) five degrees to the east. Add extended runway safety areas, blast pads and larger aircraft turnarounds. Construct a paved taxiway between the runway and terminal area and a paved aircraft parking apron adjacent to the passenger terminal building. Provide airfield lighting for nighttime medical evacuation. Demolish the existing ARFF/maintenance/administration building and storage shed and construct a new, larger facility fronting the paved apron. Construct a covered baggage area adjacent to the passenger germinal building and improve amenities in the terminal. Relocate the lighthouse access road outside the AOA as far as the Federal property boundary. Improve the airport access road between the terminal and Settlement on its present alignment. Improve utility systems to serve other airport developments. Acquire and/or obtain avigation easements for additional airport land. The plan proposed improvements to the airport on the basis of requirements governed by the 100 per day visitor level. It recommended that the improvements be made in the 1991-1992 time period. No other improvements are planned through the master planning period which extends to the year 2008 because the NPS has no master plan for park development. The total cost of the improvements was estimated at $8.3 million. Because DOT policy requires that only improvements desired by the residents of Kalaupapa would be made, a ballot was prepared for use by the patients and residents workers to assist in deciding what improvements would be made. A compromise plan was then developed that would meet minimum requirements for air service at Kalaupapa. The compromise took into the account the recommended development plan, the historic nature of Kalaupapa and the archaeological sites surround the airfield. The Compromise Plan assumed that the current level of air service, which includes air ambulance capability and scheduled passenger service represents the minimum design requirements. The planned runway to 2,700 feet is the minimum length required by the air ambulance service to operate at the airfield. The minimum runway length recommended by the Master Plan is 3,000 feet. The compromise runway layout could provide 2,900 feet of effective takeoff length and 2,550 feet for landing exclusive of overrun with waivers from the FAA for shortened Extended Runway Safety Areas and displaced thresholds. To meet the recommended FAA criteria of 95 per cent crosswind coverage and minimize disruption of air service during construction, the runway will be realigned five degrees to the east. Other FAA requirements implemented in the Plan include 300 foot by 150 foot extended runway safety areas; 150 by 75 foot blast pads; and a 75 foot runway width. The design for the runway and blast pads will incorporate full strength pavements. To accommodate nighttime operations, airfield lighting will be provided including runway edge lights, runway end/threshold lights, and airport rotating beacon, a lighted wind indicator and segmented circle, and any obstruction lighting the FAA might require along the cliffs south of the airport. Modifications to the taxiway and apron are minimal to preserve the historic nature of the park. The plan provides for a new stub grassblock taxiway connecting the existing apron to the new runway. The existing aircraft parking area will remain untouched except for expansion of the grassblock area. To allow for nighttime operations, reflectors will be positioned to outline the taxiway and apron area. Also, floodlights will be installed in the terminal area to illuminate the aircraft parking area. Only minor improvements will be made to the terminal area, including the facilitation of the movement of patients from the parking area to the aircraft. The final compromise plan included improvements to the runway ($3.3 million), grassblock taxiway and aprons ($500,000), Terminal Area Improvements ($200,000), Access Road Improvements ($1.6 million), and new airfield lighting ($500,000). The same time frame will be used for implementation. A groundbreaking ceremony was held for the improvements to Kalaupapa Airport. A dedication was held for the improvements to the airport. This included realignment and widening of the runway, strengthening of the barge wharf and removal of rocks from the berthing basin; and resurfacing more than seven miles of community roads. Cost: $9.2 million. The state, community representatives and Maui County officials have been working together to develop a master plan for Lanai Airport through the year 2005. Approval is pending by the Maui County Council for rezoning of agricultural land for airport use. The State Land Use commission gave its approval for the rezoning which will be used for expansion of the terminal and extension of the runway. Improvements to the runway and infrastructure were completed and a dedication held. Cost: $8.1 million. Design work is in progress for a Precision Approach Path Indicator to provide safer landings. Act 116, SLH 1998, appropriated $500,000 for design and construction of a perimeter fence. Island Air and Pacific Wings implemented a substitute service, code-sharing and marketing agreement that will offer expanded flights to Hana and Kalaupapa. The U.S. DOT issued Order 2000-2-24 which designated Kalaupapa as a community eligible to receive subsidized small community air service under Section 41736(a) and selected Pacific Wings to provide that service for a two-year period at an annual subsidy rate of $272,807. A perimeter fence was installed. Cost: $500,000. The U.S. DOT selected Pacific Wings to provide Essential Air Service to Kalaupapa for two years using Cessna Caravan aircraft. Service required 12 nonstop round trips each week to Honolulu. The contract was renewed until March 31, 2007. A project to restore terminal facilities was completed. Cost: $148,000. Act 160, SLH 2006, appropriated $4.2 million for plans, design and construction for an EA and Part 139 compliance improvements to ARFF. Pacific Wings declined to apply for an EAS subsidy and began providing scheduled service to Kalaupapa without subsidy. This arrangement allowed Pacific Wings to create its own price schedule as well as to cancel flights without regard to the EAS program and the impact it had on the public. As of June 2010, the airline’s one-way ticket price from Honolulu to Kalaupapa, as posted on its website, had risen to $500. This has created a burden on residents of Kalaupapa and the staff of the settlement. The HDOT has been working with the U.S. Department of Transportation on the EAS issue to assure that Kalaupapa has regularly scheduled service at a reasonable cost as required by the Airline Deregulation Act of 1978.